If you are a resident of Medfield, MA you've probably already heard of the Sharon Music Academy. You've listened to our students violin performance at your friend's home, school concert, public park or on local cable TV station. You've probably also read about our students' achievements and about our Academy in the Medield Press, Wicked Local Medfield, Boston Globe or online. Or may be you had a chance to listen to our students playing or singing at New England Sports Academy in Westwood where Sharon Music Academy also offers music programs and lessons. Sharon Music Academy has an extensive violin program. Our students successfully pass auditions and play in prestigious orchestras such as Boston Youth Symphony Orchestra, New England Conservatory Orchestra, All State Orchestra, South Eastern Massachusetts Orchestra and many local and school orchestras. Over more than 30 years of teaching violin, we have many students, who have achieved the role of concertmasters for the District and SEMSBA orchestras. Our students have opportunities to perform on world-renowned stages, including Carnegie Hall in New York. Aspiring violinists from the Sharon Music Academy participate in many local, national and international competitions. The Academy also provides its violin students an opportunity to play chamber music and perform with professional musicians. Many of our former students continue to play in college orchestras and amateur chamber groups. Most importantly, however, our students acquire the skill, love, and appreciation for violin that lasts a lifetime. 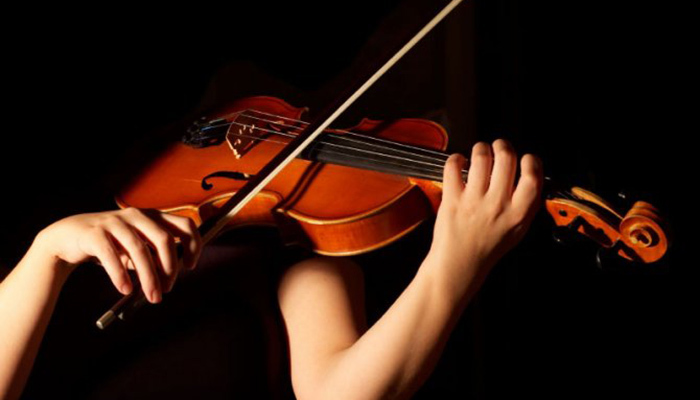 We offer 30-minute, 45-minute and 60-minute private violin lessons. 30-minute lessons are recommended for children under the age of 8. Our violin program provides a structured approach to music education with an emphasis on mastering violin and combines the Suzuki as well as the traditional approach to violin study. Our teaching process builds the foundation that allows our students play different styles - from classical to Irish fiddle. We also offer Preparation for ABRSM Exams. ABRSM is the world's leading provider of music exams and assessments. Preparation for ABRSM exams is a very good way to get a structured violin education and ABRSM diplomas and certificates are internationally recognized levels of proficiency in music. Register for violin lessons online or contact us if you have any questions. Q. What is the recommended age at which to start private violin lessons? A. The recommended age is 5 years. However, it is never too late to start learning and enjoying violin. We have students as young as 4 years old and as mature as 79. Albert Einstein started to learn violin at age of six. Q. I want to try violin lessons. Where should I start? A. If you are a beginner it usually makes sense to start by renting a violin. To make it more convenient for our students the Sharon Music Academy has arranged with several vendors to deliver and exchange violins on site. Please follow the links below. Rayburn Music. Please choose “Affiliate: Sharon Music Academy” in “Select District” drop-down menu. Write down the confirmation number and email it to us. Students of the Sharon Music Academy may also have discounts on some instruments sold by Rayburn. Violins come in different sizes and if you don’t know what size you or your child needs there is plenty information online to help you determine the right size. When renting a violin for the first time don’t forget to get a shoulder rest. For high-end instruments visit Carriage House Violins. Occasionally, when a student outgrows a violin, he/she will sell their prior instrument by posting an ad on our bulletin board.